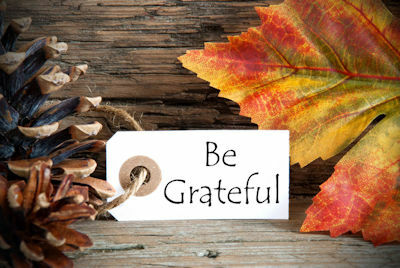 Thanksgiving gratitude realizes that we become truly happy when we focus on what we have rather than what we have not. Families have various traditions to include gratitude into Thanksgiving Day. If you would like to start the tradition or change up the one you have, use this list of ideas as your inspiration. Use the following ideas with your family through November or use them on Thanksgiving Day with your guests. Decorate a dry erase board or chalkboard with Thanksgiving-themed decorations. Tie chalk or a dry erase marker onto a string then attach the string to the board. It is fun to see what others write. Decorate your jar however you want. You can use slips of paper or cut out leaves from cardstock to write on. Place the jar, leaves or slips of paper and a pen on a table. Invite people to write what they are grateful for on the leaves and drop into the jar. The family blessing jar tradition is a precious way to instill gratitude in your children with the simple act of recording blessings throughout the year. Children of all ages will enjoy this memory building exercise. First, find leaf templates on the internet or use your die cutting machine to cut out the leaves from fall-colored construction paper or cardstock. You may be able to find paper leaves at your local craft store. You can display your leaves on jute or a string strung across a fireplace mantel, a doorway or the wall. Clip them on with a clothespin or paper clips. Or you can use a stick as in the picture above and tie strings that hang below it to attach your leaves to. There are numerous ways to make a Thanksgiving gratitude tree. It can be made of paper and attach to a bulletin board or the wall. Your second option is to use twigs placed in a can, vase or jar. The leaves may be decorated or left plain. Check out the ideas below by clicking on the pictures. Buy a pack of thank-you notes and have your family write why they are grateful for one another, other family members, friends, neighbors, etc. Two or three sentences is a good length. Many families have the tradition of going around the table with each telling what they are thankful for. Here are some ideas to vary the tradition. When your guest arrives, have them write what they are grateful for on a slip of paper and put it in a basket. Or you can use a gratitude jar. Later have your guests draw a piece of paper from the basket and read what it says. You can discuss what it states or guess who wrote it. Assign someone to interview the guests about what they are grateful for and why. Film the answers. The video will be something you can watch for years to come. Have the guests state why they are grateful for the person sitting beside them or across the table. It is always nice to hear you are appreciated! If someone gets skipped, have everyone at the table state why they are grateful for that person. Collect gratitude quotes, write each on a piece of paper and place in a basket. Have your guests draw one of the quotes and read them. Please share your ideas for Thanksgiving gratitude in the comments below. We would love to hear them.